The Honda VFR 750F was nothing, if not versatile. It is widely considered to be as close to the ultimate all-rounder, as a motorcycle gets. The 'VFR' played footsie with perfection ... then improved upon it! Fast, fine-handling, and styled with finesse. The Japanese in-line four engine layout had the market covered. Before the VFR arrived, that is! Its water-cooled, 16-valve V4 proved a more than viable alternative. The V4's 100bhp output gave a top speed of 150mph. Sweet stats, if you can supply 'em! The VFR's 460lb dry weight - though not slimline, as such - was more than acceptable for a bike of its size. 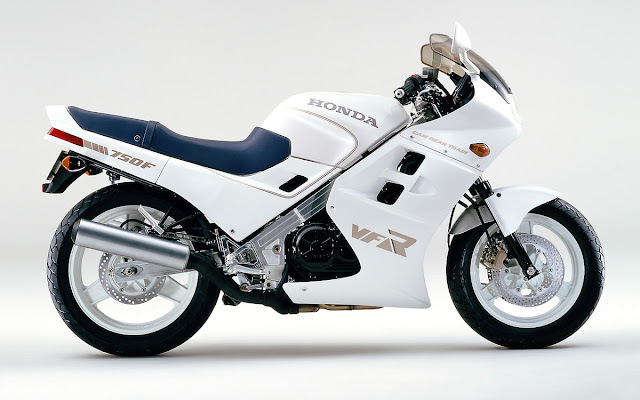 And the VFR featured a twin-spar aluminium frame ... new chassis technology, at the time. Visually, too, the VFR impressed. Its bodywork sliced cleanly through air. The paintwork was sprayed to last. Deftly drawn ducts set off discreet graphics. Neat tucks and folds were in abundance. Unsurprisingly, the VFR was a success sales-wise. And Honda needed it to be. The VFR's precursor - the VF750 - damaged the Japanese giant's reputation. It took reliability issues to another level! The VFR 750F restored faith in Honda ... and did so in style! My pleasure, Richard ... thanks for checking it out!